Copper is essential for many major plant functions like photosynthesis, respiration and enzymatic processes. It also affects strength of plant cells, fruit flavour and sugar content. 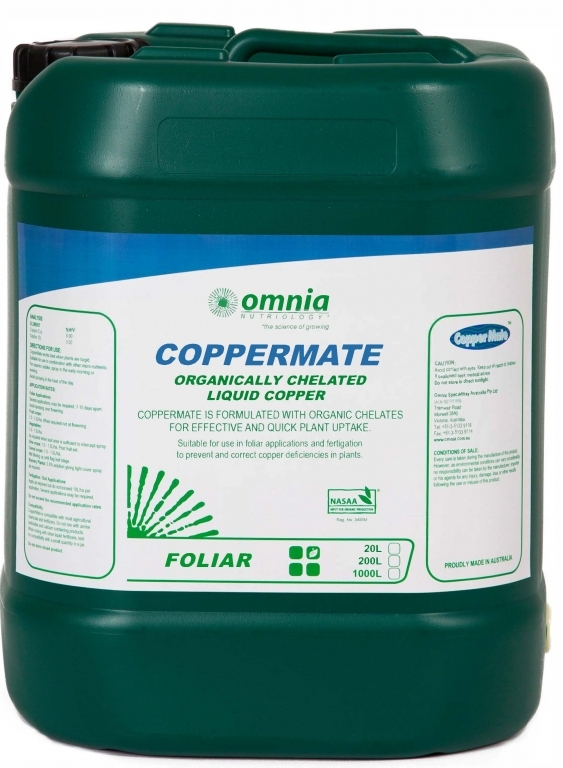 CopperMate is effective in correcting Copper shortages in field and horticultural crops. Liquid Copper formulated for quick plant uptake to effectively correct copper shortages. 1.0 – 1.5 litres/ha when required, not at flowering. 1.0 – 1.5 litres/ha as required when leaf area sufficient to intercept spray. 1.0 -1.5 litres/ha post fruit set. 1.0 – 1.5 litres/ha . Mid tillering up until flag leaf stage. 0.5% Solution giving light cover spray as required. CopperMate is a NASAA-Certified organic product of choice.